Will humans one day live on other planets than on Earth? I don’t know the answer to that. But I know that if humans attempt to settle on extraterrestrial land, we will want to take plants with us to provide us with food and make our air breathable (1). Before we can successfully embark on space-farming adventures, we need to understand how plants react and adapt to the extreme conditions in space and what genes or metabolic pathways are switched on in this process. Reporter genes help us to study responses to external conditions and stresses. Some of these genes encode enzymes which convert a chemical substrate into a visual signal (for example blue colour or emitted light). 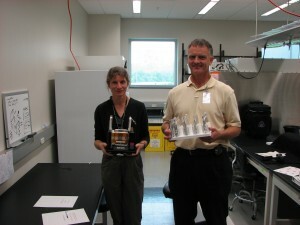 The disadvantage of these reporter genes is that they require a person to carry out experiments on plant tissue. As crew time is precious and the first long-distance space flights are likely to be fully automated, we need reporter genes which do not require human assistance to be visualised and give off a signal that can be transmitted telemetrically (e.g. by satellites). Paul and co-workers (2) argue that GFP is an ideal reporter gene for this purpose and describe a prototype plant GFP imager which they are testing in the Arthur Clarke Mars Greenhouse. The greenhouse sits in the Haughton Crater on Devon Island, Canada, also described as “the closest thing to Mars on Earth“. This area is ideal for the simulation of space experiments as it has extreme terrain and climate conditions and allows human access only for a short time during the year. In order to study the response of plants to this environment, researchers look at genes which are known to be switched on under stress conditions such as heat, cold or low pressure. These genes are under control of promoters – stretches of DNA preceding the coding region – which sense such conditions and regulate gene expression accordingly. When we exchange such a gene with our reporter gene GFP, we can create a plant that lights up in response to certain external conditions – a bit like a Morse signal light, only without the fast blinking. 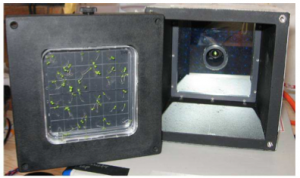 The model organism used in these experiments is good old Arabidopsis thaliana, grown on plates that fit perfectly into the GFP imager. The plate is illuminated by blue-light emitting LEDs. The light signal passes through a filter and is then captured digitally and transmitted via satellite modem to Simon Fraser University. What can such a remote space imaging system be used for? There are actually two functions for these glowing reporter plants. The first one is, as already mentioned above, to understand which genes are switched on in plants while they adapt to space conditions. This would make it possible to improve plant lines in order to help them cope better with these new stresses. Once their reactions are better characterised however, these plants could also act as biomonitors to provide information about their environment to the crew (3). I am completely fascinated by the idea of growing plants in space and the research based around it and hope to hear more from tiny arabidopsis astronauts in the future!